Fresh clean flavors are what I am always looking for in the summer time. This salsa is one of my favorite to have it is light and great with BBQ Chicken or on its own as a snack. It is very easy to make as it only involves cutting up a few items and mixing them together to marinate. 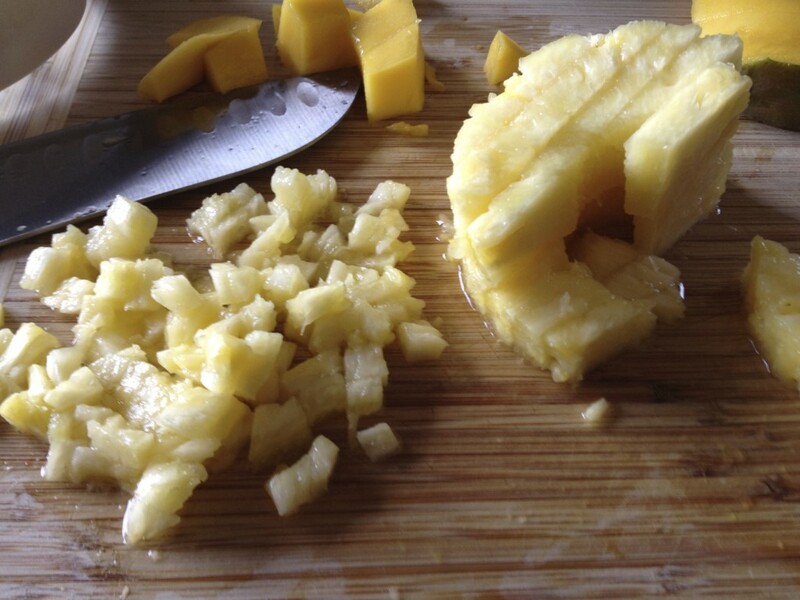 I find the easiest way to make this recipe is to first cut up all your ingredients. 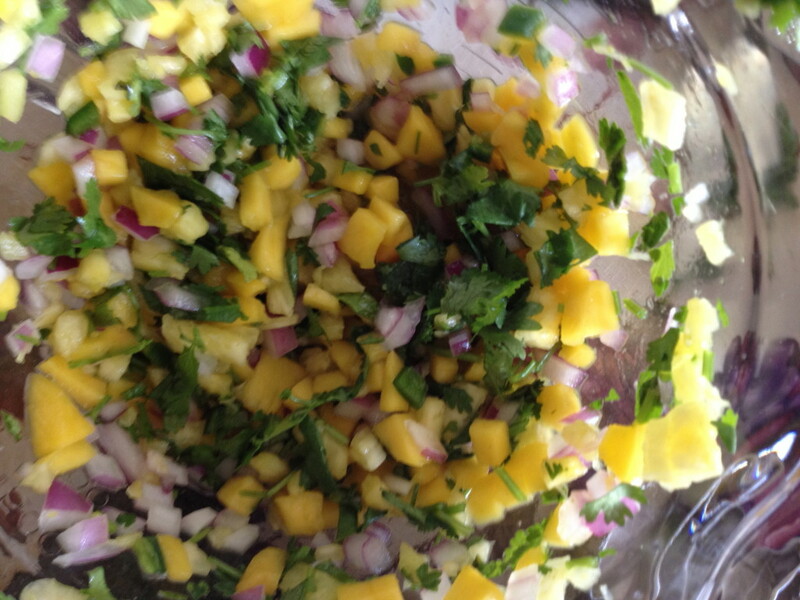 Chop mango and pineapple into small chunks, dice the red onion and cut the jalapeno pepper in half and remove seeds the mince. Be careful as juices from the pepper can burn your skin, my suggestion would be to wear disposable gloves when mincing. 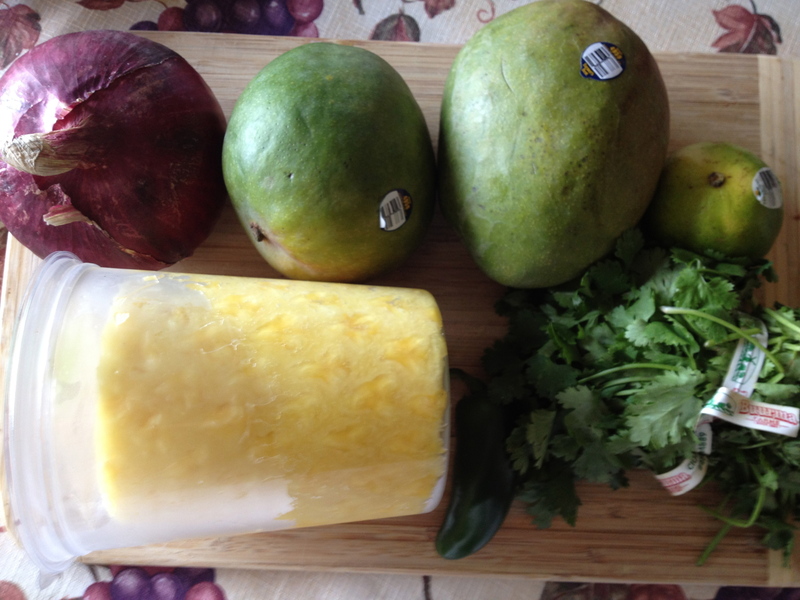 Mix the four ingredients together, then zest and juice one lime over ingredients. Let sit for 30 min at least in the refrigerator so salsa can set up. Over night is even better. 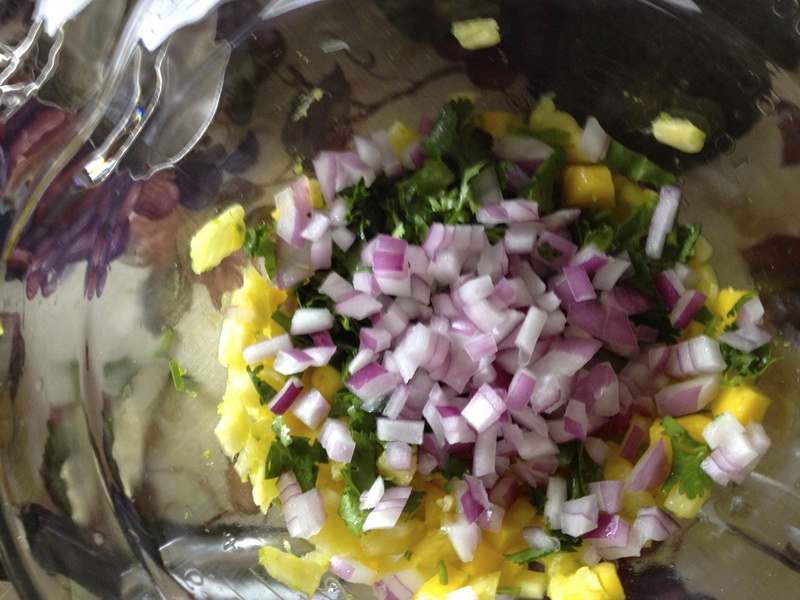 Just before serving should you choose chop cilantro and mix in. 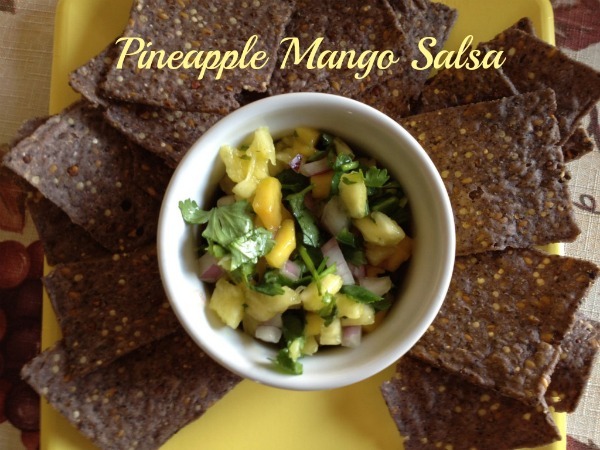 The salsa is great as a snack or appetizer served with my favorite tortilla chips: Way Better snacks Unbeatable Blues Tortilla Chips, as they are gluten-free and a non-gmo product. I also serve it with BBQ chicken and avocado. I coat my chicken in Stubbs BBQ sauce and let set for 30 minutes in the refrigerator before grilling. Make sure that the chicken thickness is the same in each piece for even cooking. My secret to great grilled chicken is to first make sure the grill is clean. Before lighting the grill I take a paper towel and a good quality cooking oil and rub the grates down so the chicken does not stick. Then I light the grill to high heat. Place the chicken on the grill for about 2-4 min before rotating 45 degrees and let cook for an additional 2-4 min before turning over and repeating the process on the other side. Lastly, you should make sure that you have a great meat thermometer to check make sure the chicken is cooked completely through. If the chicken isn’t done just close the grill lid and let it cook for an additional 5 minutes. 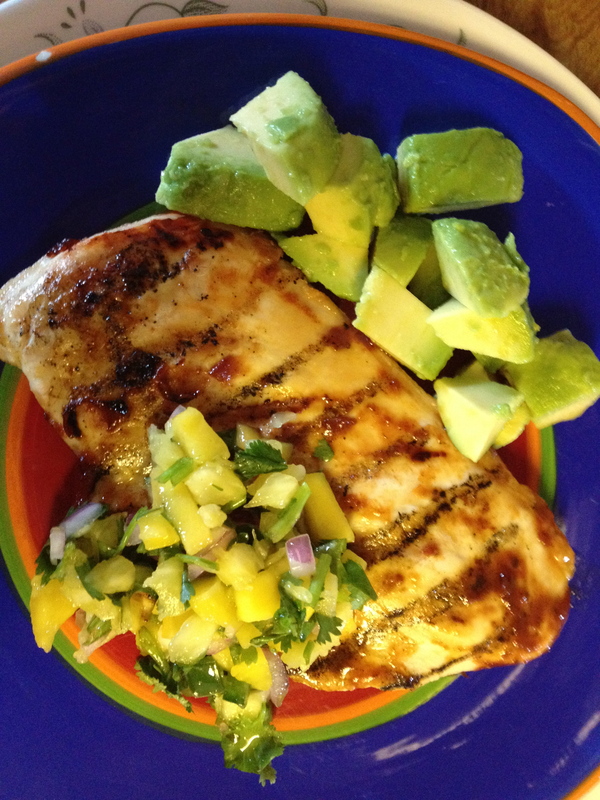 Serve with fresh-cut avocado and mango salsa. This looks delicious! I have almost all the ingredients and am going to have to make it this week!